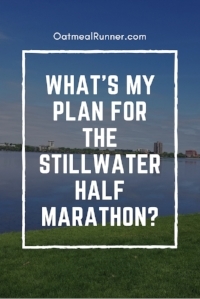 What's my plan for the Stillwater Half? When this post goes live, I’ll be starting the Stillwater Half. I ran this race back in 2015 and finished in 2:32:26. The last half I ran, the Lake Minnetonka Half in May 2017, I ran a PR of 2:10:51. So what’s my plan for this race? The plan is to have fun, plain and simple. I was thinking about attempting a PR (or running close to my current half PR) but that just isn’t exciting me as much. It doesn’t help that the high on Saturday is 94 and sunny. It is not going to be PR weather and I need a break from racing. Which is also why this is the last race on my calendar for 2018. Since 2015, I’ve been training to run faster or further. And it’s been a fun journey but now I’m ready to run just to have fun. I’ll be talking a little bit more about how I’m transitioning into non-race training in the upcoming week but let’s focus on the Stillwater Half for now. I’m planning to run at a comfortable pace (whatever that will be given the weather) and enjoy myself. The race starts out in the woods on the Gateway Trail and I’m going to take in the scenery and enjoy being out in the woods. I’ll have my music on but not as loud as I usually do so I can take in the sounds around me. I’m going to enjoy the feeling of running to run again, not running to PR. Have you run a race for fun? I’d love to hear your experience in the comments! 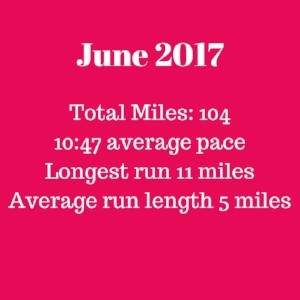 June was an awesome feeling month for running and it also went by so fast! I got in my first full month of marathon and also into double digit long runs. I think my favorite part of running this month is the runs Mike has joined me on. It's nice to know there's someone else there with you, even if that someone is on a bike and meeting up with you at certain spots. We're getting into longer runs for July and I'm excited for Mike to be there with me (and also the idea that he could carry stuff for me if needed). None of my runs have been horrible but I'm still getting used to the heat and I had to go on the treadmill for a couple of runs. Hopefully that doesn't happen for any of my long runs since six miles was enough on that! This June was both my highest mileage June and fastest paced June since I started tracking back in 2014, not surprising since I'm marathon training now and I've gotten much faster in the last year. Diet-wise, I've been continuing with the higher macros that I set up from the beginning of marathon training. I'm still up from my idea range but my weight has been slowly creeping down and my running performance has been feeling great. I'll be talking more about this next week after I do measurements again but I'm not too worried. My clothes are still fitting the same so I'm guessing it's a combination of water retention and alcohol intake that's causing my weight to be higher. I still haven't finished An Echo in the Bone but I'm so close to the end. I should finish it in the next couple of days since I have about two hours left in it. Not too bad for working my way through a 46 hour audiobook. I have the next book in the Outlander series, Written in My Own Heart's Blood, ready to go and after 45 hours of that I will be all caught up on the series! But, I think I'm going to listen to a different book in-between them. I have How Bad Do You Want It? by Matt Fitzgerald downloaded and I think I'll do a little non-fiction "reading" before finishing off Outlander. It's an eight hour focus on mental toughness in regards to racing and sounds pretty interesting. I'll do a review once I'm finished with it. It's been hot in Minnesota lately, highs in the 80s hot. And it's probably not going to get any cooler. 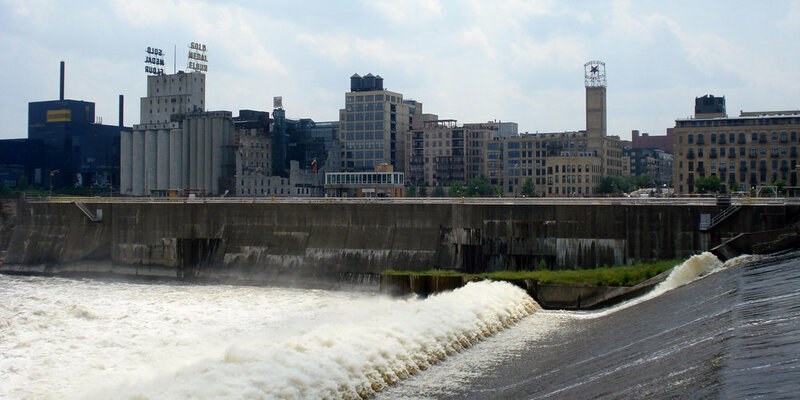 So I figured I'd share some of the ways I stay cool (or at least try to) during my summer runs. Probably the easiest way to beat the heat and stay cool is to either run early or late in the day. Earlier in the day will be more humid (but cooler) and later in the day will be less humid (but cooler). Right now, I'm running three runs early in the day, getting out no later than 8 a.m. but I'll probably have to switch my Tuesday and Thursday runs to later at night as it gets hotter. Even at 4 p.m., it is still pretty close to the high for the day so I might be getting those runs at 7 or 8 p.m.
Run in as little as possible I've given up on being self-conscious about what I'm wearing when I run (see my first post where I talk about my short shorts), in the summer I don't really give a damn if it means I'm cooler. I wear as little as possible (remembering to sunscreen up any uncovered skin), sometimes running in just a sports bra and shorts. It feels so much better not running with a wet shirt clinging to me. Carry water Even on my short three miles, I'm carrying my handheld water bottle so I can sip on water if I need it (and have something to drink as soon as I'm done running). I've also been adding in Nuun also for extra taste and electrolytes. It gives me a chance to take a short walking break while I take a sip and my mouth tends to get dryer when running in the heat. My routes have water fountains along them but right now it's easier to have my water on me so I can drink whenever I want to. No matter where I'm running, if it's hot outside I head for the shade wherever I can find it. Of course, this doesn't work well on a crowded path but if I can I'll switch sides to run in the shade. Just getting the sun off of me for a little bit cools me down and gives me a break for the extra heat of it on my skin. It's tough but the one thing I'm working on during the summer is slowing down on my runs. One reason is because I'm targeting a slower pace for the marathon but also because I've been burning myself out trying to go my normal pace in the heat. It might be able to run at a 10:30 pace for one mile but it takes way too much out of me. So, slow and steady is going to win the race this summer! What are some of your tips for running in the heat?